The world's first bitcoins were mined ten years ago this week. 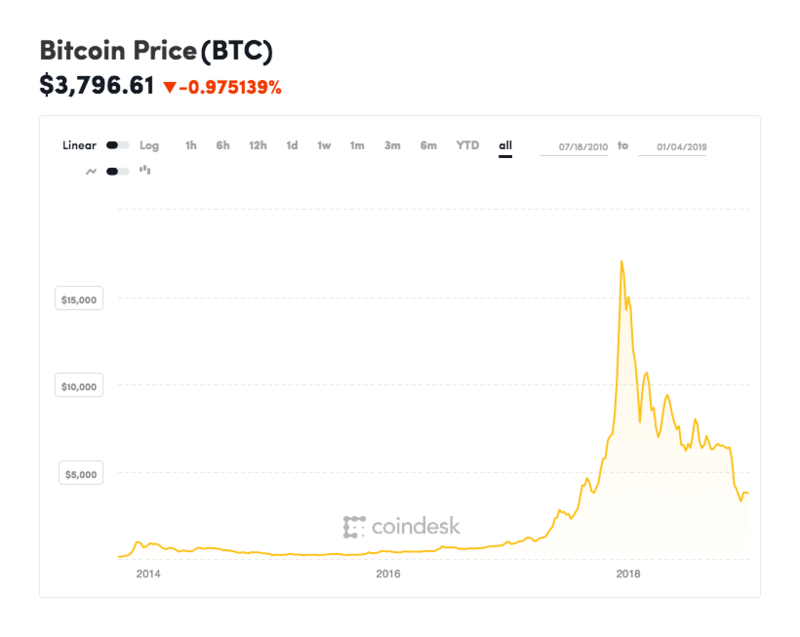 Bitcoin's price has been on a rollercoaster over the past decade, hitting nearly $20,000 in December 2017. The cryptocurrency is currently trading around $4,000. Since then the cryptocurrency has been on a wild ride, surviving massive price swings, hackings and intense global scrutiny. Bitcoin's ups and downs have helped the asset go from a little-understood concept to a household name. "Over the last 10 years we've gone from this didn't exist to now pretty much the entire world understands what it is, whether they agree with it or not," Mati Greenspan, senior market analyst at trading platform eToro, told CNBC on Friday. CNBC takes a look at bitcoin's tumultuous price history over the last decade. The first bitcoins were mined in a block of 50 coins called "Genesis Block" on January 3, 2009. The act of mining bitcoins entails computers trying to solve complex mathematical problems to validate transactions. Computers compete to verify a group of transactions known as a "block." The computer, or miner, that can validate the block the fastest receives a reward in bitcoins. The concept of bitcoin, and its underlying blockchain technology, was laid out in a white paper published in October 2008 by Satoshi Nakamoto, whose true identity remains a mystery today. Nakamoto envisioned bitcoin as an alternative form of electronic cash that would not require the backing of the government or a financial institution. The first-ever bitcoin transaction took place on January 9, 2009 between Nakamoto and software developer Hal Finney. It's widely believed the first real-world bitcoin transaction was made in May 2010 by programmer Laszlo Hanyecz. Hanyecz spent 10,000 bitcoins on two Papa John's pizzas; those pizzas would now be worth more than $30 million at today's bitcoin price. Bitcoin gained public attention later in 2010 with the creation of an exchange called Mt. Gox. The Tokyo-based exchange allowed investors to trade bitcoin, which was priced around $0.07 per coin for most of that year, according to CoinDesk. Bitcoin's price hit a milestone $1 in 2011. But a series of hacks on the Mt. Gox exchange that year exposed the cryptocurrency's vulnerability to big price swings. Bitcoin topped $1,000 for the first time in November 2013 but the spike didn't last long. The cryptocurrency would close the year trading at around $700, according to data from CoinDesk. Mt. Gox, which handled roughly 70 percent of all bitcoin transactions, declared bankruptcy after hackers stole roughly half a billion dollars worth of coins. The hacking exposed the lack of regulation in the cryptocurrency and scared away many investors. By the end of 2014, the price of bitcoin barely breached $300, a level where it would stay for the next three years. Bitcoin momentum started to build in early 2017, when the price of a coin again crossed $1,000. More investors bought into the idea of a decentralized currency, seeking a safe-haven investment similar to gold. To meet growing demand, two U.S. exchanges, the CME and Cboe, created platforms for customers to trade bitcoin futures. As the cryptocurrency went mainstream, frenzy ensued. Bitcoin's price surged from around $2000 in July to nearly $20,000 in December. Bitcoin's price dropped from sky-high levels to kick off 2018 as investors fretted the bubble was bursting. Regulators around the world started to crack down on cryptocurrency trading, causing particularly volatile price swings. Many hedge funds, retail investors and traders who had bet big on bitcoin took heavy losses as the digital asset's price plummeted, closing the end of the year at around $4,000. "The last 10 years for Bitcoin, whilst broadly telling a hugely successful story, has also not been without difficulty," wrote David Thomas co-founder of London-based cryptocurrency exchange GlobalBlock in an email to CNBC on Wednesday. Bitcoin bulls say a comeback is due but retail investors might not want to stomach continued volatility. Regulatory uncertainty is likely to remain one key factor in bitcoin trading this year. "If, as expected, increased regulation enters the market then Bitcoin will be opened up to a broader investor base, and with increased adoption, we expect to see volatility reduce and stability increase both of which will establish Bitcoin and cryptocurrencies further as an asset class in their own right," added Thomas. — CNBC's Kate Rooney and Arjun Kharpal and Reuters contributed to this report.